Official PA TV host Walaa Al-Battat: "The occupation government, which claims it is democratic and has won the support of some of the world's super powers, has built itself on the bodies of children, and it still murders, imprisons, and tortures them with the most extreme types of torture..."
Use of firearms against those who throw rocks and firebombs - Following the violent events of September 2015 in which Palestinians threw rocks and firebombs at homes and cars in Jerusalem leading to deaths of Israelis, the use of Ruger .22-caliber rifles by the police was approved by Israel's General Attorney, Yehuda Weinstein, at the request of Prime Minister Benjamin Netanyahu. Policemen are instructed to shoot only in life threatening situations and to aim at the rock throwers’ legs. 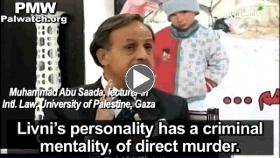 PA TV hate clip demonizes Israel as committing genocide in "game of terror"